Love food? You will find incredible food in Italy! Pizza, lasagna, polenta, ossobuco, carbonara and more!! No better way to experience authentic Italien than to eat while you visit the countryside. As you tour, you will also find incredibly elaborate architecture, idyllic countryside, and fascinating history. This quick intro to Italy will give you all that and more. Fashionable Milan and Da Vinci’s Last Supper; the famous Venice canals and Piazza San Marco; Florence’s medieval bridge Ponte Vecchio; the Leaning Tower of Pisa; Rome’s ancient trio the Colosseum, Pantheon, and Vatican City. What more could you ask for? Here is the complete itinerary! Contact us for more details. Arrive at any time. We recommend arriving a day early to fully explore this world-renowned city. 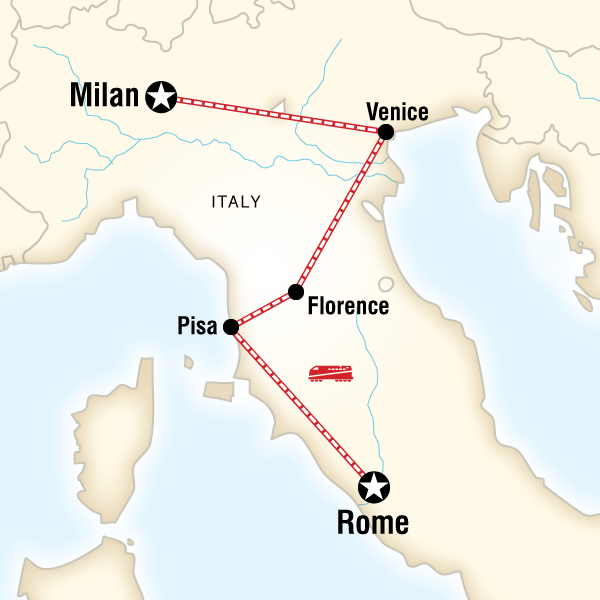 After an orientation walk of Milan, set out on your own explore the fashion capital of Italy. Opt to see Leonardo Da Vinci's Last Supper before travelling to Venice by train in the afternoon. Take an orientation walk of the Eternal City before enjoying a free day to explore a myriad of options. In the evening, enjoy a true taste of Italy with a traditional Roman meal. Buon appetito!